Here we grow again! Ground has been broken for Blue Ridge’s newest project: Blue Ridge Station. 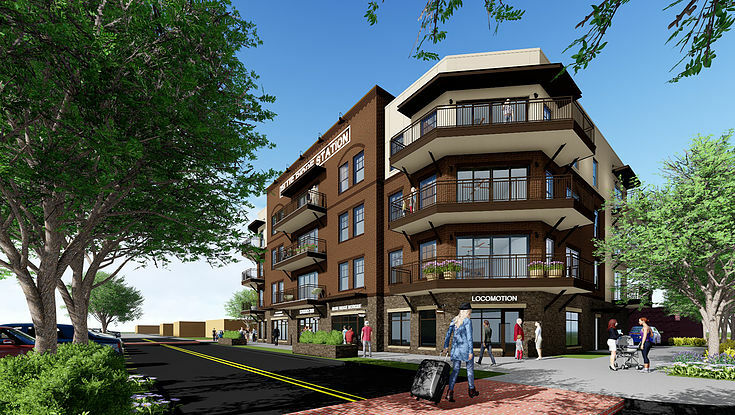 A mixed-use development, there will be retail space on the ground floor and loft living on the upper three floors. The building itself has one foot in the past and the other in the future. With a nod to Blue Ridge’s past, the building will look something along the lines of an old brick warehouse. Inside, however, you will find the most up-to-date amenities. The ground floor will consist of upscale retail spaces that offer open, light-filled shops with convenient parking. Located alongside the Blue Ridge Scenic Railway, it will be easy to stop into one of the shops and eateries that fill the retail spaces. Upstairs, there are three floors of lofts – 15 in all—each offering two-bedrooms and two-baths. The 10-foot ceilings provide plenty of natural light and an overall burnished glow from the gleaming hardwood floors and natural color palette. Each has a balcony that overlooks the storybook city of Blue Ridge, helping you feel a connectedness to the city and its denizens. Each unit comes with two parking spaces in a well-lit, secure area to the rear of the building and there is no public access to the lofts. There is also a large area for dog-walking — or cat-walking if that’s your thing! The kitchens boast furniture-grade cabinetry, farm house-style sinks and quartz countertops. There are three different floor plans to suit a variety of tastes. The lofts are perfect for full-time living, vacation rental/retreat, or a get-away from the pressures of city life. You are right in the center of beautiful downtown Blue Ridge so you can easily enjoy the many restaurants, shops, and galleries that are right in your front yard.. You are also oh-so-close to the many natural amenities in and around Blue Ridge, like trout fishing and kayaking on the Toccoa River, hiking and biking on the miles of trails that criss-cross Fannin County, paddle boarding on Lake Blue Ridge. Enjoy the best of all worlds at Blue Ridge Station. For more information and to keep up with the progress of the project, give Nathan a call. He will be glad to assist you in anyway possible to make your Blue Ridge dreams come true!